The ‘watercolour’ effect of the silk used in this sack is achieved by a weaving process called ‘chiné’. The warp threads were wound on a frame and printed with a design. They were then transferred to a loom and the weft threads woven in, resulting in a blurring of the warp pattern. Most chiné silks were imported from France and were more expensive than silks woven in Britain. A woman's sack and stomacher of light beige chiné woven silk in a pattern of vertical meandering bands of narrow pink and yellow lines around which twine trails of maroon. Between these bands are columns of red flowers on green foliage with a maroon floral spray at intervals along either side. The sack is open at the front, with double pleated robings extending to the hem and elbow-length sleeves with double, pinked and scalloped sleeve ruffles. The bodice is lined with coarse, unbleached, pieced linen. The sack is made of 6 widths of silk, with a triangular gore at the side front. The back has two, double box pleats, stitched at the neckline. There is no waist seam, the skirts are pleated into the side back seam of the bodice. The silk has been carefully pieced in places. 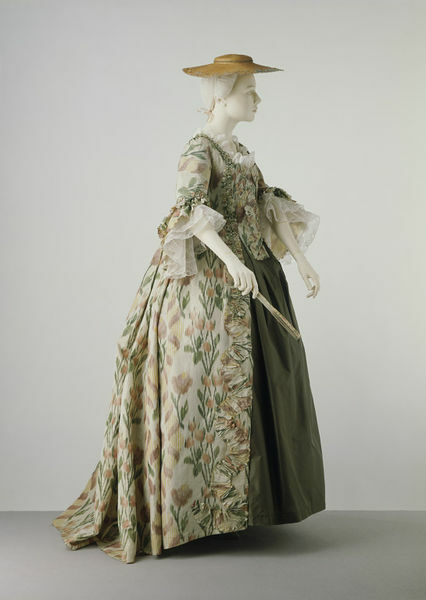 A ruching of pinked and scalloped silk, decorates the back neck and robings of the bodice, and continues down the robings of the skirts in a serpentine line and increasing in width. Folds, stitch marks and the piecing suggest that the silk was remade into the present garment, although its original form is not evident. 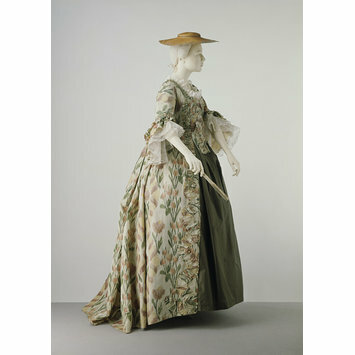 The ensemble was altered for fancy dress in the late 19th century. The stomacher was originally in two pieces and was stitched down the centre to a band of pink silk. Darts (now removed) were added to the stomacher. The sleeves were taken in (now unpicked), and the short edging of green and white floss silk fringe was probably added to the robings at this time.